New pedestrian bridge helps connect Swansea community, but for how long? The city of Denver broke ground Saturday on a new pedestrian bridge in the Elyria-Swansea area. DENVER -- The city of Denver broke ground Saturday on a new pedestrian bridge in the Elyria-Swansea area. The bridge is meant to help people commuting by foot or on bike to cross over the Union Pacific railroad tracks between the two neighborhoods. The $15 million project is part of the 10-year, $937-million Elevate Denver Bond Program , which was approved by voters in 2017. The bridge, which will be built near 47th and York, was one of the most requested projects by residents in the community. One of the major problems getting from Elyria to Swansea is that the trains will sometimes stop on the tracks for 15 minutes or more and a detour around the train is not feasible for someone walking from one neighborhood to the next. Instead, some residents end up trying to cross through the train cars to get to the other side. Gomez and his grandson walk across the train tracks multiple times each week to get to the library. They say they wait up to an hour at times for the train to clear the intersection. The delay is also causing many children who attend Swansea Elementary School but live in the Elyria neighborhood to be late to class. The principal of the school, Gilberto Munoz, estimates that about 100 of his students live across the railroad tracks and that his school experiences tardiness due to the trains at least once a week. “It’s a huge sore spot in the community and it has been forever,” Munoz said. When the students are late, they are not only missing out on the first part of class, many students are missing out on school-sponsored meal programs. About 98% of the student body at Swansea Elementary qualifies for free or reduced lunch. Part of the problem is that the trains don’t have a set schedule, according to Munoz, so families aren’t able to try to plan around them. “We’ve learned through this process that train companies are second to God almost. There’s no way to get them to set a schedule or to build a bridge or a safety connection,” he said. That’s why Swansea and Elyria residents turned to the City of Denver for help. City officials hope the bridge will alleviate most of that since pedestrians will have a new, safer way to cross the tracks. Mayor Michael Hancock, Councilman Ablus Brooks and several city council members all attended Saturday’s official ground-breaking ceremony for the bridge and spoke about its importance for the community. The Swansea area is no stranger to construction; it sits in the heart of the Central70 construction project to expand the highway. However, Denver officials decided to accelerate the bridge project to have it completed before Central70 construction interferes. Otherwise, the bridge might have been put off until after the highway project is completed in 2022. While the pedestrian bridge is widely supported by the community, some long-time residents say it’s not enough. “Now we have infrastructure here, they’re putting a pedestrian bridge, but that’s not adequate,” said neighbor Armando Payan. “We’ve been neglected for over 100 years. As you can see, we don’t even have adequate sidewalks here, there’s no bike lanes." Payan believes the area and the people who call the neighborhoods home are being neglected as construction continues. “We’re more than left behind, we’re an afterthought,” he said. It’s a concern principal Munoz has heard quite a bit about from parents, particularly when it comes to the Central70 project. “It very quickly became apparent that they were going to get priced out of their own community, and that it likely was not going to benefit them in the long run and that they were going to have to move out,” he said. 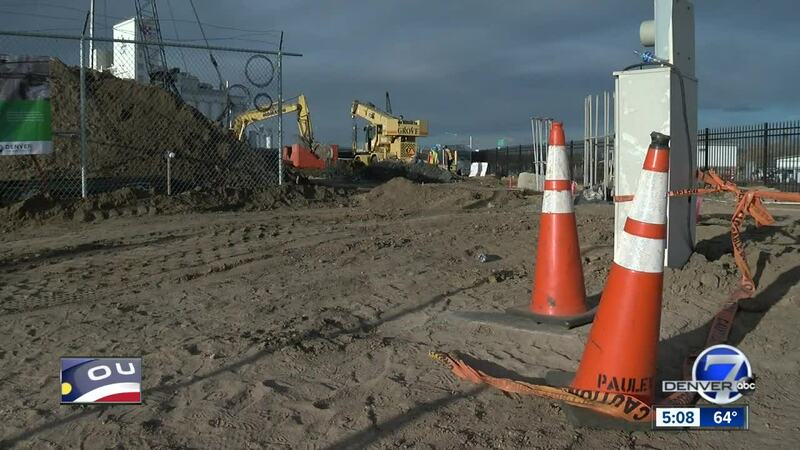 While Munoz and families in this community are looking forward to the pedestrian bridge in the short-term and having a safer commute from one neighborhood to the next, many are worried whether they will be able to stay here once all the construction work is done. The pedestrian bridge is set to be completed by the end of 2019.